Since 2004 we have been preparing quality, gluten-free baked goods for our customers. Herbalicious has a dedicated gluten-free in-store kitchen where we create our array of bakery delights, using only the freshest, most natural ingredients. Items that we currently offer include breads, rolls, cookies, sweet breads, decorated cakes, and our customer favorite... cupcakes! Each month we do a special, seasonal flavored cupcake! April showers bring May flowers, but also these delicious carrot walnut cupcakes. A delicious spiced cupcake filled with freshly grated organic carrots, freshly chopped English walnuts and topped with our creamy rich creamed cheese frosting. 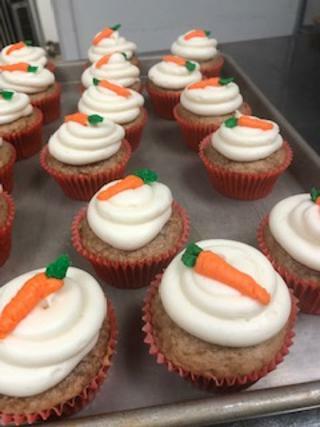 Ashley worked her magic and created little carrots to sit atop that mound of frosting. We'll have them through April, so hop in and get yours by the individual, half or full dozen. Cream Cheese frosting available at an additional $0.30/per cupcake. Contains a variety of 14 cookies plus one cut-out sugar cookie and 5 bar cookies (our pick, unless ordered 4 days in advance of pick-up) and Hershey's Chocolate Kisses. Gift wrapped and ready to give! ​*Bar Cookies for special order must be purchased by the dozen. *Soy free frosting on all cakes by special order. Additional $2.00 charge per layer. ​Sandwich Bread* (23 oz loaf) $6.99 Contains Dairy. Cinnamon Bread (26 oz loaf) $7.49 Contains Dairy. Artisan Italian Bread*~ (with cheese and herbs – (15 oz loaf) $7.29 Contains Dairy. Foccacia*~ (with cheese and herbs – ( 7 oz, 8 inch round) $4.25 Contains Dairy. Pepperoni Rolls with or without cheese - ( 4.25 oz roll) $22.99 1/2 dozen * Cheese rolls contain dairy. *Rolls must be ordered by the half dozen or dozen.